Tuesday through Saturday: 9:00 a.m. to 4:30 p.m.
Closed Mondays and on holidays including Christmas Eve, Christmas Day, Thanksgiving, New Years Eve, New Years Day, Good Friday and Easter Day. For questions, please call (302) 674-2111. Free Admission on select Downtown Dover Festival Days (ie: Dover Days, 4th of July, Comic Con). For questions, please call (302) 674-2111. Tour rates and facilities rentals are available; please contact the museum for details. Tickets can be purchased here. This ticket includes admission to all feature exhibitions on view at the Biggs Museum. Presenting this ticket at the time of your visit will allow you to skip the line if there is one. Gift passes are available and can be purchased at the front desk of the museum. 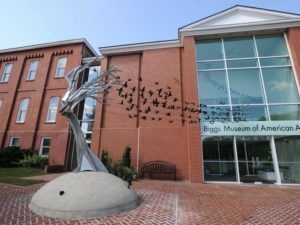 Throughout the year, the Biggs Museum also hosts special events and lectures for which fees may apply. Biggs Museum members receive free admission and discounts on select events. Click here to learn more about Museum Membership.